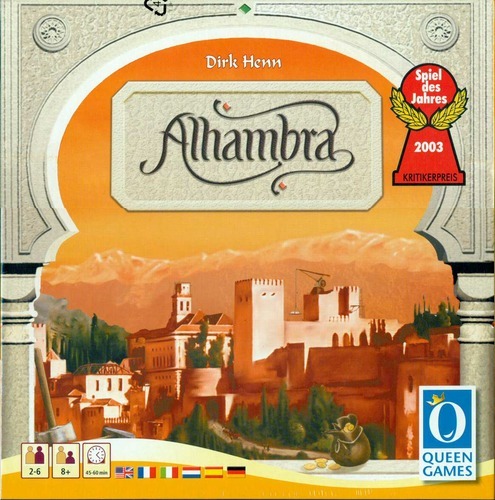 In Alhambra, players are acquiring buildings to be placed within their Alhambra complex. On a player's turn, a player may take money from the open money market, purchase a building from the building market, or engage in construction and re-construction projects with buildings that have been placed in the player's reserve. The game rewards efficiency, as when a player purchases a building from the market for the exact amount of money, the player may take another turn. Players with the most buildings in each of the seven building types score in each of the scoring phases, and points are awarded for players' longest external "wall" section within their complex. The game ends when the building market can no longer be replenished from the building tile supply, and there is a final scoring, whereupon the player with the highest score wins. When their ambitions conflict, the houses of Westeros collide! 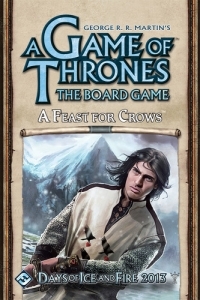 A Feast for Crows is a special scenario for A Game of Thrones: The Board Game Second Edition that provides players with a compelling new four-player scenario. Introducing an alternate victory condition, shortened play time, and a set of playable House cards for House Arryn, A Feast for Crows offers a chance to experience the game in a variety of new and exciting ways. 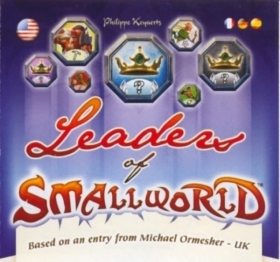 This expansion of Small World is a promotional expansion first given away at Spiel 2009 in Essen. The expansion is based on an idea of Michael Ormesher in a Days of Wonder "Race design contest". The expansion consists of 24 leader tokens that are neither a race nor a power. When you pick a new race, you can opt to buy its leader. The leader acts as an additional race token. The leader, however, disappears as soon as the race goes into decline. Also, the leader is brave, which means that he can only be staying at regions that are not immune. Leaders can be held hostage for ransom. If the ransom is not paid, the leader counts as two victory points at the end of the game for the player that captured the leader. 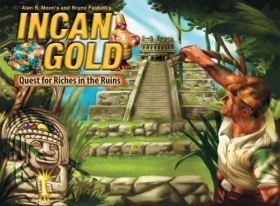 Incan Gold is a quick, fun and tense game in which you and other adventurers explore an old Incan temple in search of gold and treasure. In each of the five rounds, you secretly choose if you want to continue exploring the temple in search of more treasure or retreat to the safety of your camp with your share of the treasure that has been discovered so far. After five rounds of exploration, whoever has the most treasure is the ultimate explorer and winner!